Today I’m continuing the theme of holding on to wonder. For all the hard and challenging things we face every day–there’s still so much wonder to behold. I want to hold on to wonder. Sometimes, I look at a friend request and flip through my memory files to figure out where I know the person from. Was it a speaking event? Are they a reader? Is it someone from church? Bible study? A writers conference? My memory’s not as good as it used to be. I blame having children. It certainly can’t be my age. At least that’s what I tell myself all. the. time. I feel like I live multiple lives, and sometimes I can’t remember who belongs where. I’ve started telling stories, like about how I used to do ventriloquism, and realized too far in that the person has no idea what I’m talking about because they aren’t from where I think they are so they don’t have the backstory. It can get a bit awkward. Again, we’ll blame something other than age. Anything other than age. But back to this gal and her friend request. This gal I’ve known since I was five. We grew up together, and because of where she lives, she hasn’t been on Facebook for quite awhile, and e-mails and even letters haven’t been easy to get to her. I clicked “accept” and immediately posted on her wall. These are the times I adore social media. Over the course of a couple of days we reconnected over private messages. Sometimes, the messages were instant, even though we are thousands and thousands of miles apart. Have I mentioned how much I love technology? The re-connection was beautiful. Even tearful because of the deep joy of our encouragement to each other. Friendship is a wondrous thing. It’s a gift to have someone in your life who sticks by you, who sees your flaws, who has seen you at your worst, and still chooses to be in a relationship with you. It’s true love–the kind that Jesus defined. In fact, He commanded it. I’m not easy to love. In fact, sometimes, I’m really quite annoying. Demanding. Negative. I could go on. But there are a blessed few who’ve seen all that and still stick around. They call out a change of course in love. And they come back the next day to check in on me. That’s a wonder to me. I know I don’t deserve it. When my husband had cancer, they not only prayed, but insisted on bringing meals. And if they were too far away to bring meals, they sent care packages in the mail. When I’m battling the depths of anxiety, they speak Truth over me and remind me that God is still at work in my life. They remind me that I’m fearfully and wonderfully made and that He isn’t finished and I’m still a work in progress. It’s a mystery to me as to why we connect with some people so easily–how the friendship flows like a beautiful river, refreshing each other. When the refreshment flows both ways it’s such a beautiful gift. Some seasons the river might be more full, and sometimes the flow decreases to a trickle as we enter a different stage of life–whether it be physical distance or time-consuming responsibilities. But the wonder of great friendships is how you can pour a bit more water in and the river picks up right where it left off, no matter the time or distance. I’m thankful for friends who knew me when I was a gap-toothed talkative kid. I’m thankful for friends God brought along when I was a newcomer in town and didn’t know a soul. I’m thankful for friends who turned around and said hello in a sea of one thousand other writers. I’m thankful for friends who stopped me at the grocery store and said, “Hey, our kids are in class together, right?” I’m thankful for friends who wrote letter after letter to stay in touch long before e-mail existed. I’m thankful for friends who answer late-night panicky text messages. I’m thankful for friend requests on Facebook that allow us to re-connect. I’m thankful for the wonder of friendship in all its forms. I so want to be that kind of faithful friend and return what has been so graciously given to me. I want to be that reflection of Jesus’ love to others. Pour a bit into your river of friendships today. Pick up the phone. Make a call. Send a text. Write a card. Make a surprise visit. Bake some cookies. 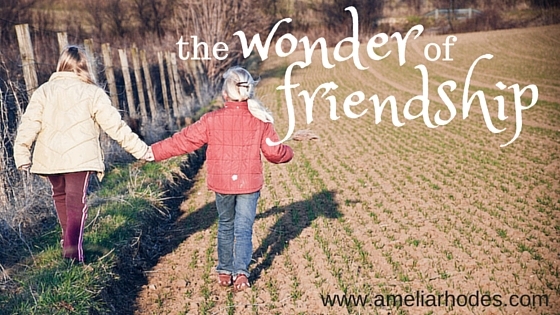 Awaken the wonder of friendship. photo credit: title photo bekassine… creative commons, text added by Amelia. I love this! And I super love you! ((hugs)) I super love you too! I love this. Thank you so much for sharing this article – it was so encouraging!! Amy, I absolutely remember you! And your mom! I am so excited to hear you started writing a blog, and thank you so much for letting me know how this one encouraged you. Much love to you!